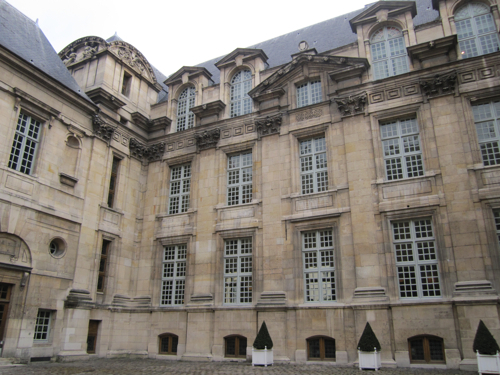 La Bibliothèque Historique de la Ville de Paris (BHVP), although located in the heart of the Marais neighborhood, is something off the beaten track. No tourist will coome across it by chance. But this former aristocratic hôtel particulier called Hôtel Lamoignon, built in 1585, is worth a visit and not just for it's magisterial courtyard adorned with Corinthian pilasters. 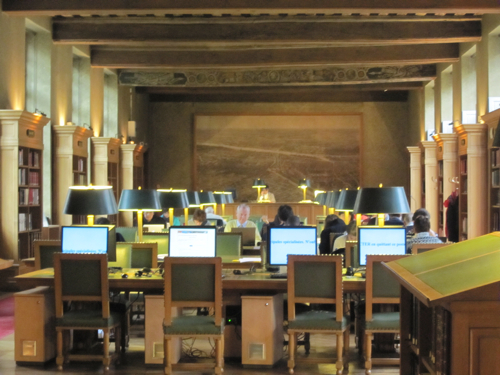 Why not spent a silent and studious afternoon here in the cosy, somehow intimate, never crowded reading room? If you have the most peculiar questions about Paris that nobody is able to answer? Then this is your place. The library is actually disposed of an impressive collection of more than 2 million documents dating from the 16th century to the present, composed of about a million books and pamphlets, 21,000 manuscripts, as well as plans, maps, and photographs. Good question. You’ll find an answer in a book. It will be delivered within a short time and you can consult it at a huge desk among other people buried in books, manuals or manuscripts. Her comes a bit of history concerning the library itself: The Bibliothèque Historique de la Ville de Paris is the oldest public library in Paris and opened its doors in 1763. Back than, it was situated in the Hôtel Lamoignon, a beautiful palace constructed at the end of the 16th century for Diane de France, daughter of Henri II, which explains why the beams on the ceiling of the reading room are decorated with hunting scenes. Diane, after all, was named after the goddess of hunting. Eight decades later, in 1847, the library was moved to the Hôtel de Ville itself, where the collection burnt down during the fire of 1871, when the town hall was set on fire during the Paris Commune. In the meantime, the sumptuous Hôtel Lamoignon was used first as a jam factory, than as a laundry. In 1969, finally, the library moved back there. Sitting here at the huge desks, browsing through books, is just the perfect occupation for everybody mad about Paris.